The two BMW works drivers will each race one of the pair of Rowe Racing entries in Barcelona on September 30 after their victory with the Walkenhorst team at Spa in July put them in contention for the championship. Their score from Spa, which included points won at the six and 12-hour marks, has propelled them to third in the championship, just five points behind championship leader Raffaele Marciello. Blomqvist will drive the #98 Rowe BMW M6 GT3 with Nicky Catsburg and Jens Klingmann, while Eng will team up with Alexander Sims and Jesse Krohn in the #99 car. Blomqvist told Autosport: “Barcelona wasn’t originally on my programme for this season. Blomqvist is making his second Endurance Cup appearance of the season with Rowe after notching up no points with 11th place at Paul Ricard in June. He finished seventh on the road together with Chaz Mosert and Klingmann before a time penalty for a safety-car infraction dropped the car outside the top 10. 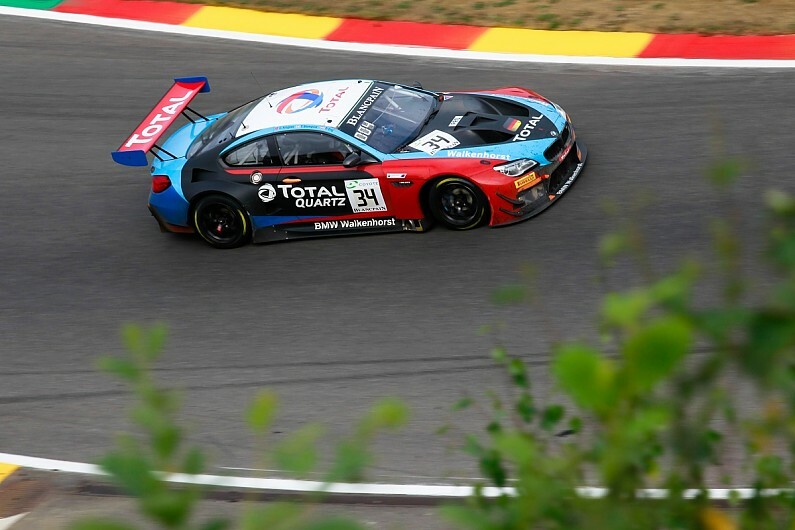 Eng, who contested four of the five BGTS enduros with Rowe last year, was making his seasonal debut in the series at Spa following his promotion to BMW’s DTM squad. “Historically it hasn’t been a good track for the BMW,” he said. “But it has been resurfaced and it’s now less abrasive and has more grip than before, which can only be beneficial for us. “The disappointing thing is that without the penalty at Ricard, I’d be leading the championship. He is again teamed with factory driver Maxime Martin and Marvin Kirchhofer in the #62 Aston Martin V12 Vantage. Auto Sport Promotion Mercedes racer Marciello has the chance to make history in Barcelona by becoming the first driver to win all the three BGTS titles outright in one season. The Italian sealed the BGTS Sprint Cup with Michael Meadows at Nurburgring last weekend and leads the overall standings as well the Endurance Cup points heading into the series finale. Marciello shares his ASP Mercedes-AMG GT3 with Tristan Vautier and Daniel Juncadella. Second place in the Endurance Cup points is held by the Black Falcon Mercedes line-up of Yelmer Buurman, Maro Engel and Luca Stolz.